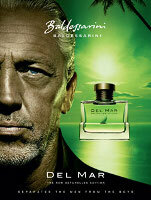 Baldessarini will launch Baldessarini Del Mar Seychelles Edition in April. The new limited edition fragrance for men is a flanker to 2005's Baldessarini Del Mar, and celebrates "cheerful summer days on board the BALDESSARINI yacht" heading for the "idyllic island world of the Seychelles". The notes include watermelon, black pepper, angelica, nutmeg, clary sage, blond tobacco, oak, leather and gaiac wood. Never mind this – where on earth can I buy Strictly Private? It was launched last month and I can't find it anywhere. I have a feeling it will get here eventually, but if you're in a rush you could order it from Douglas in Germany. Sorry about this, but I sniffed Strictly Private today, and really liked it! It's woodsy/musky and certainly wearable by women. If it's in the UK, I'm guessing it won't be long before it's across the pond. If you happen back through, tell us where you found it! One of my Basenotes colleagues has got a bottle. He's in Holland but his father brought it in for him from Germany. I've emailed P&G via the Baldessarini website requesting stockist information and whether they could send me any samples. I'll let you know what happens. Oh and I might try this Seychelles thing as well. Although I don't remember being that struck on the Del Mar original. I have the original Baldessarini which I love as well as Ambre which I also like. House of Fraser, Bluewater, if that helps! Thanks! Doesn't help me but might help someone else. Good luck — hope they'll get you a sample. OT does anyone know who the man is in these ads? Mmmn, yes, I'd like to know who he is as well. Nice to see a mature face. Take watermelon out of this and I like the sound of the juice too. I tried Strictly Private the other day (House of Fraser, City, London) and really liked it but then it hit me – Iso e super! And Robin I remember you saying that once you'd started recognising the note the stuff kept cropping up everywhere……. Hey, sounds like the perfect gift! To quote Oliver Twist “please sir, I want some more” !!!!! Not sure but he might actually have long hair…might just be pulled back here. Saying that because I have the vaguest memory of seeing him in another Baldessarini ad w/ longer hair…but I do have a terrible memory. Anyway, still agree w/ your general point! This sounds great but not sure about the watermelon. Perhaps it is faint as the other notes sound like they would kill watermelon. I must give this a sniff. I also like the ad. It is nice to see an ad without a barely pubescent male wearing very little. Oh no! Say it ain't sooooo. . . . Tuberose in a fragrance and long hair on a man . . . two absolute deal breakers for me. Well, I guess it's back to the '80's for me and Tom Selleck as the Marlborough man! Thanks for the (brief) fantasy . . . . I still say that's a darned good looking man. But I like longish hair. It sounds too aquatic for me, but agree on the ad. Nice.